As I was writing this book, my friend’s son returned unscathed from his tour of duty in the Iraqi War. Many people had prayed for him daily while he served overseas, and rejoiced when he arrived home safely. A few months later came horrible and shocking news: My friend’s son had been killed in an automobile accident a few miles from his home. His mother wrote to tell me that it was the most difficult thing she had ever faced. I could not imagine her grief. She ended her brief note with “What to say. . .” I understood what she meant: faced with such a tragedy, there was little one could say. St. Paul instructs the Thessalonians about death so “that you may not grieve as others do who have no hope.” Some have misinterpreted this passage, claiming that Christians are not to grieve. Unfortunately, modern funerals often resemble canonizations, minimizing or denying altogether the painful reality of separation that death entails. Instead mourners are forced to put on a “party face,” to celebrate death even when the survivors are numb with the shock and pain of their loss. The death of a loved one is more like Good Friday than Easter Sunday. The darkness that covered the earth on that first Good Friday points, I believe, to the grief of God at the death of his Son. Though Jesus would rise on the third day, the first day was one of horror, pain, and utter grief for all of creation. Our Lord is recorded in Scripture as crying three times. In the Garden of Gethsemane (Hebrews 5:7), he prayed with tears; he wept over Jerusalem and prophesied its destruction (Luke 19:41); and Jesus wept at the tomb of Lazarus (John 11:35). The third instance is especially puzzling. Jesus was about to raise Lazarus from the dead. So why did he cry? Were his tears for other senseless deaths that take place at every moment of the day? Or was it because the death and sin Our Lord had come to save us from had not yet been utterly vanquished? There is no doubt that it is human to grieve. However, St. Paul tells us that our grief should not be like the grief of those who have no hope of seeing their loved ones again. Our grief should move us toward assisting our loved ones along their journey toward God—daily remembering them in prayer, asking God to remove any obstacles that might keep them from hearing his voice when he calls their names. I heard a famous theologian say that the greatest problem within the church today is the subtle secularizing of it. A modern funeral is likely not to mention purgatory, or to offer prayers and Masses for the dead; instead, we observe, “Funerals aren’t for the dead but for the living.” My, how many have lost the faith in what we are doing! When we participate in the liturgy where the entire body of Christ is present, the poor souls and triumphant saints join us in worshipping the one true God. Together, we offer our sacrifice with Christ to the Father through the Spirit. Funerals aren’t for the dead? To be charitable, one could imagine that such a statement reflects the belief that those who believe in Christ do not die but fall asleep. I have attended some services where such statements have been uttered, but they ring hollow. The loss is all too real. Our society tends to shield itself from the physical reality of death, something that Archbishop Fulton Sheen called the new taboo. This secular problem has crept into the Church. Whenever we are told not to be sad but to rejoice, that we are an “Easter people” who believe in life, not death—one wonders if these people have ever lost a loved one. Some professional liturgists were angered when the Order for Christian Burial, the official rite of the Catholic Church for funerals, permitted the wearing of black or purple vestments as well as white for Funeral Masses. “It’s a step backward,” they said. In actuality, it is a step of truth, a step toward Christ. One of the most powerful images in the movie The Passion of the Christ is the sorrowful mother. I think we all can relate to her pain, because it is the pain that we all feel when confronted with the horror of death. How ridiculous would it have been if Mel Gibson had portrayed Mary as happy, telling everyone, “He’ll rise on the third day, rejoice now, don’t be sad.” That would have been sad indeed. The modern world fears death. Because we exist in a post-Christian world, the resurrection of the dead is still accepted as fact, yet apart from faith in Christ the resurrection of the dead lacks any scientific basis. No one ever points this out, but it should be before it is too late for those who do not know Christ. In the Gospel of John, Jesus states clearly that he can give life to the dead. This is the hope of every believer in Christ. At the moment of his crucifixion, Jesus gave life to one of the criminals nailed with him. No such promise is given to the unrepentant thief. Jesus and Paul both make it clear that, while Our Lord is a life giver, he also is a judge. For some, eternal life will lead to eternal hellfire. My friend’s statement, “What to say. . .” is a poignant reminder that the death of any human being causes us to face the ultimate fall of our first parents. It startles us into the reality of the fragile hold we have on our own lives and the lives of those we love. Every present moment is a gift; so is every future hope. We exercise that hope by continuing to pray for our loved ones. If God has welcomed them into his kingdom, our prayers will come back to us. There is great comfort in knowing that this communication goes on—those without faith sense this too and often act upon it. The Gospel of John tells us that those who “hear his voice” will rise to life (John 5:28). 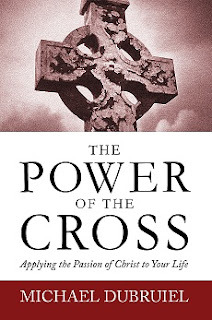 Focusing on the cross of Our Lord helps us to hear his voice. The horrible effect of sin is death; the saving effect of the cross is life in Christ. What death takes away from us, the saving death of Jesus can restore. May we never forget that truth, neither when a loved one dies nor at the hour of our death.